Preheat oven to 200°C (400°F). Place the potato in a clean tea towel and gently squeeze to remove excess moisture. Divide the potato, salt and oil between 2 large oven trays and toss to coat. Bake, turning once, for 25–30 minutes until cooked and crispy. While the potato is cooking, make the cheese and beer sauce. Melt the butter in a medium saucepan over medium heat. Add the flour and mix well to make a smooth paste. Cook for 1 minute or until it starts to bubble. Add the beer, milk and mustard and stir until the sauce starts boil. Cook, stirring occasionally, for 4–6 minutes or until thickened. Add the cheeses and continue stirring until melted and smooth. 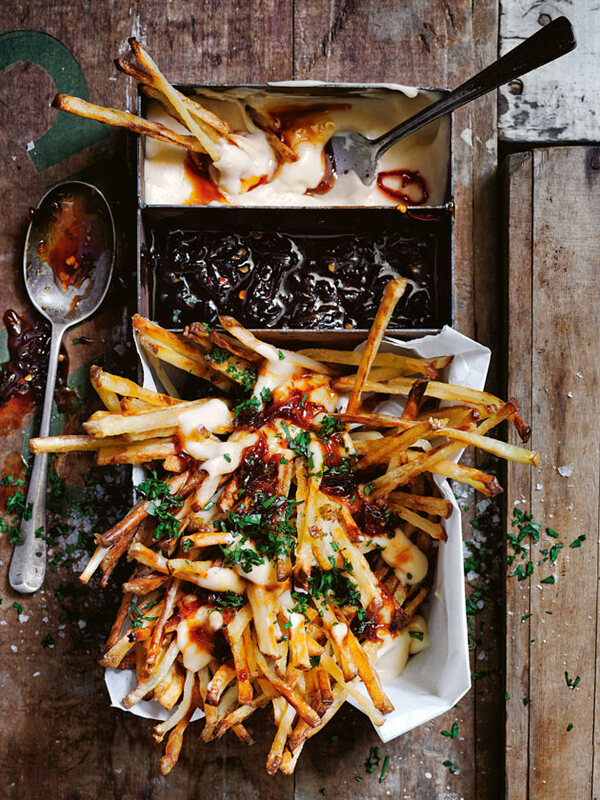 Top the fries with cheese and beer sauce, caramelised chilli and rum jam and parsley to serve. Serves 4. + We used our caramelised chilli and rum jam in this burger, but you can use any store-bought chilli sauce.